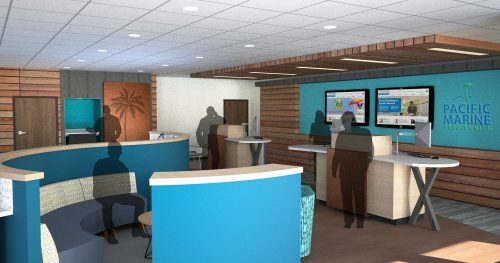 Seattle, WA (September 1st, 2017) – Pacific Marine Credit Union is bringing a different kind of branch experience to Oceanside, California’s Camp Pendleton. 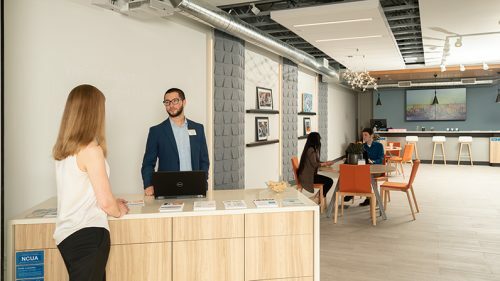 The credit union is partnering with Momentum, a Seattle based design-build firm, to create a space designed not only for retail banking, but also for service members and their families to come in and relax. 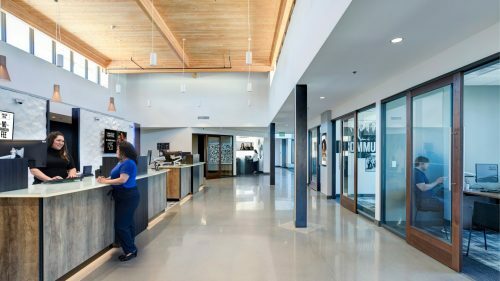 The branch is located near a transit hub on the base, and this community oriented design gives marines and their families a place where they can hang out while they wait for buses. There is also business station with tablets and printers, open to members for browsing the internet and taking care of paperwork. Oceanside is a coastal city, and Momentum’s interior designers chose materials and designs that bring the local atmosphere into the branch. Slightly distressed wood with metal accents call to mind coastal structures, and a curved blue center piece brings the sitting area, children’s activities, and tech bar together in a wave-like motion. The open feeling branch features teller pods and unassigned hotel offices. The goal is to facilitate more personal interaction between staff and members without the formal feel of a teller line, and the ability to move about the branch and take more consultative conversations to a more casual or private setting. The branch is scheduled to open this winter. 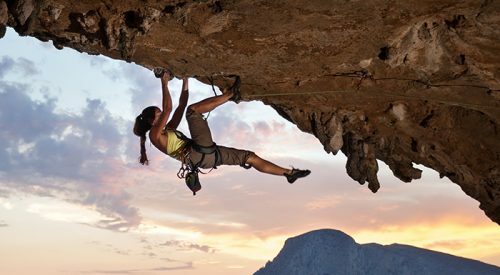 Updates on this and other projects will be posted on the Momentum website. Pacific Marine Credit Union is a full-service San Diego based financial institution that offers a wide array of products and services to anyone living or working in San Diego, Riverside and San Bernardino Counties.